Corpo Celeste heralds the arrival of a young and distinctive voice. Alice Rohrwacher's writing and directing debut is a sensitive unveiling of the moral and religious layers that can smother adolescence. Awarded the Best New Director Silver Ribbon by the Italian National Syndicate of Film Journalists, the film has certainly found favour in the critical fraternity, with Village Voice having this to say of the film: "First-time writer-director Alice Rohrwacher's minutely observed, emotionally complex Corpo Celeste would be a treat in any season, but it's particularly refreshing amid the summer-movie bombast." OK then. 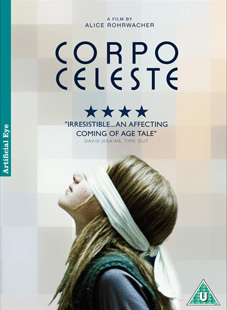 Corpo Celeste will be released on UK DVD on 10th September 2012 by Artificial Eye at the RRP of £15.99. The only listed extra feature is an interview with director Alice Rohrwacher, but if previous Artificial Eye discs are anything to go by, it'll be a substantial and worthwhile one.